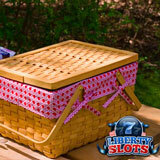 Gamblogger: Who Needs a Picnic When Liberty Slots has a Memorial Day Casino Bonus?! Who Needs a Picnic When Liberty Slots has a Memorial Day Casino Bonus?! When you say "Memorial Day Weekend" a lot of people think of picnics and fireworks. But Liberty Slots Casino has something even better for us slots players -- Memorial Day Casino Bonuses! Popular all over the world, the online casino is giving a 125% up to $500 casino bonus this weekend. You can claim this bonus up to four times between May 22 and May 26, 2015. Valid May 22 – 26, 2015 only. You'll also get double comp points on all progressive slot games, including the new Mine All Mine, as well as Keno, until the end of this month. Liberty Slots, which welcomes new players with an up to $777 Welcome Bonus, offers a large selection of unique slots games from Wager Gaming Technology that aren’t found at many other online casinos. Some of its most popular games including Cool Bananas and Amazing 7s are also available in the new mobile casino for players using smartphones and tablets.